I thought I’d have more time to spend on the blog this weekend but real life got in the way of things. There’s a long weekend coming up so I’m looking forward to working on more blog-related tasks even if Bloggiesta is over. My favorite thing this weekend is probably going through all the mini-challenges. I wanted to do so many of them but didn’t have enough time for everything! Oh and the Twitter chat was also a lot of fun. I’m glad I got to participate in Bloggiesta even if I wasn’t able to finish all of the things that I wanted to do. 🙂 Again, thanks to Suey and Danielle for hosting this event! I’m planning to participate in the next one scheduled for September 28, 29 and 30. 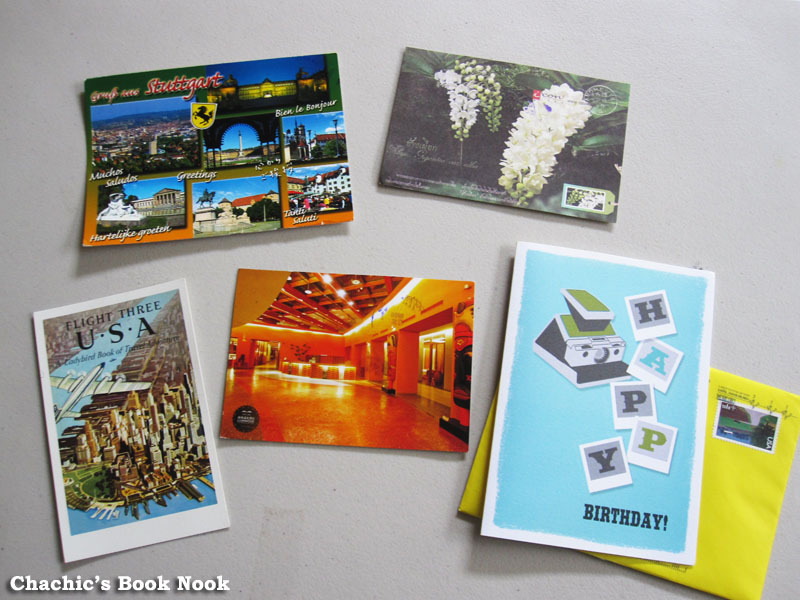 Since I created my Want Books meme during the first time I participated in Bloggiesta back in 2010, I knew I had to put up a post this weekend. 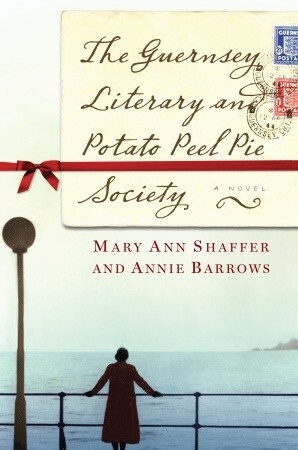 The Guernsey Literary and Potato Peel Pie Society by Annie Barrows and Mary Ann Shaffer has been on my radar for a while now. I’ve heard so many good things about this book and other bloggers have mentioned that it’s something every book lover will enjoy reading. 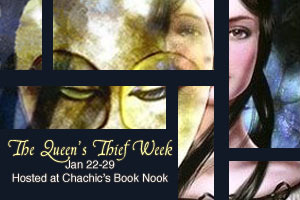 It’s also one of Elizabeth Wein’s inspirations for Code Name Verity, still my favorite book in 2012 so far. I also think I’ll like this book because I love getting snail mail. And look at that cover, it’s so pretty. As Juliet and her new correspondent exchange letters, Juliet is drawn into the world of this man and his friends—and what a wonderfully eccentric world it is. The Guernsey Literary and Potato Peel Pie Society — born as a spur-of-the-moment alibi when its members were discovered breaking curfew by the Germans occupying their island — boasts a charming, funny, deeply human cast of characters, from pig farmers to phrenologists, literature lovers all. Looks lovely, right? I have a feeling I’m going to enjoy reading this. Just need to grab a copy. What about you, what book is in your wishlist? Bloggiesta has inspired me to write a post about how book bloggers always have to balance reading with blogging. I’ve said this before and I’ll probably end up saying it over and over again: my blog is my happy place. This is the place where I can talk about something that I’m passionate about – reading books. That’s a pretty big thing for me because there aren’t a lot of people in my life interested in hearing me go on and on about the books I read. So yes, I love my blog. But there are also times when I just feel like I want to read without having to worry about writing a review. There are times when I get tired of blogging and feel like my enthusiasm has gone. Since the blog is my happy place, I don’t want to feel this way – I don’t want to feel pressured to read, review and write posts. If I really think about it, there’s really no need to feel pressure anyway. Living here in the Philippines means I don’t get a ton of review copies (aside from galleys requested from sites like NetGalley). Even if I do have galleys lined up, I’m not exactly required to read and review them. So it seems like the pressure is coming from me. And the blog isn’t going anywhere, it will still be here even if I don’t post as much as I used to. Conclusion? There’s really no need to pressure myself – I have no idea why I even do it. To keep reading fun, I make a point of choosing books that I feel like reading. Each time I’m about to start a new book, I think and consider whether I’m in the right mood for it because I don’t want to experience a reading slump. I also don’t post reviews for all of the books that I read because I don’t want to force myself when I can’t think of anything to say. I also participate in readalongs with blog friends because it’s always interesting to have more in-depth discussions. To keep blogging fun, I do my best to come up with posts that get me excited. 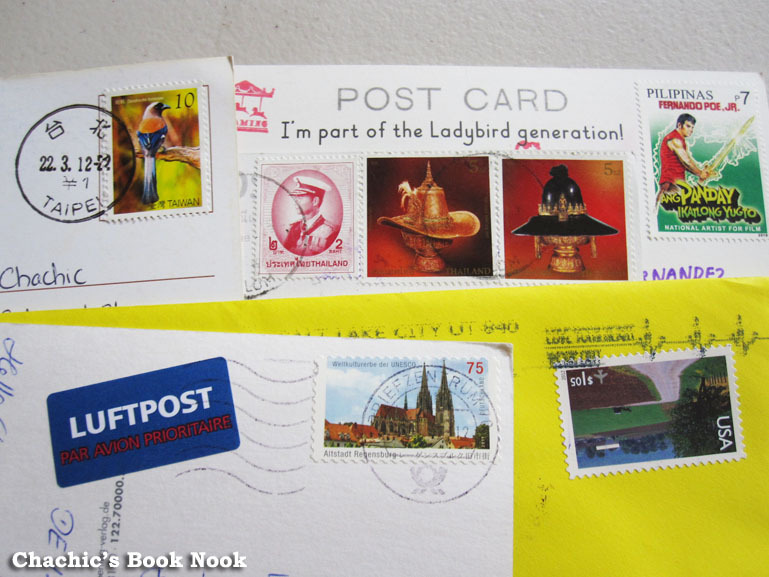 Such as features that I’ve created focused on my other interests but still related reading and blogging: Postcard Love (because I love sending and receiving postcards and I’ve discovered that other book bloggers feel the same way) and Shoot That Book (because I enjoy looking at book pictures, why not take photos and post them?). What are some of the things that you do to keep reading and blogging fun? Would love to hear your thoughts (even if you’re not participating in Bloggiesta). I’m trying to keep my goals simple because I have no idea how many hours I can put in this weekend. It would be good if I can accomplish a lot but we’ll see. Are you participating in Bloggiesta? What are your goals? Edited to add: I heard that WordPress is requiring people to login to leave a comment – I have to idea how to fix that because my settings are set to just filling in the name and email address. Sorry for the hassle, folks! Bloggiesta is a three day event where participants will spend as much time as they can working on fixing all those pesky blog related tasks…. all those things that you think “some day I’m going to clean that up, or change that around, or add that thing!” Everyone will post a “to do” list, or goals they want to accomplish and then all of us will work together to get our lists done. The fun thing is that we can cheer each other on, and learn from each other and have a blast doing it. It’s the perfect time to figure out that something you’ve always wanted to do, but didn’t know how… or to get caught up on reviews, or to fix your labels, or take control of your Reader… or do oh so many other things! I’m glad Bloggiesta is back! 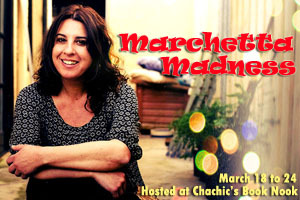 It’s a fun community event and I had a great time reaching out and chatting with fellow book bloggers when I participated before. I was also able to accomplish several tasks that I set out to do. March is going to be a busy month for me so I have no idea how active I’ll be in this year’s Bloggiesta but I will definitely join in. 🙂 I already have a couple of things in mind but we’ll see if I’ll be able to pull them off when the time comes. I wanted to put up a quick post about it to spread the word. Are you planning to sign up? That’s it for me for this weekend. I’d say I was productive even if I wasn’t that active on Twitter this time around and I wasn’t able to participate in the mini-challenges. I had fun with Bloggiesta this weekend and I look forward to the next one in June. 🙂 What about you guys, were you able to accomplish a lot of things for Bloggiesta this weekend? I haven’t done an IMM post in a while because I haven’t bought any books recently. I’m slowly working on the books on my current TBR pile. I think it’s great that I haven’t experienced a book craving (meaning the urge to buy books) recently. I already wrote a post about the Book Blogger Holiday Swap package that I received and I got my Better World Books order on the same day. I ordered these books on December 24 and it took a couple of weeks to get here. I was starting to get worried that they might’ve gotten lost in the mail. 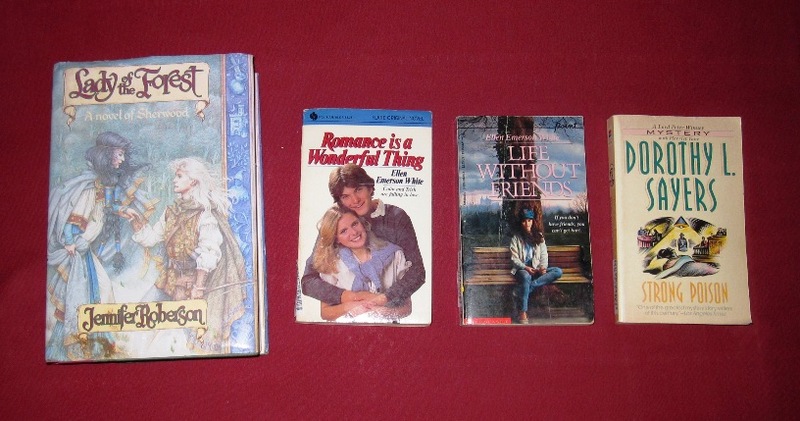 All of these books aren’t available locally and the two Ellen Emerson White books are out of print so I was excited to order pre-loved copies from Better World Books. The first three books are all recommendations by Angie while the last one is from Sounis. I look forward to reading all of them. What about you, what books did you receive this week? 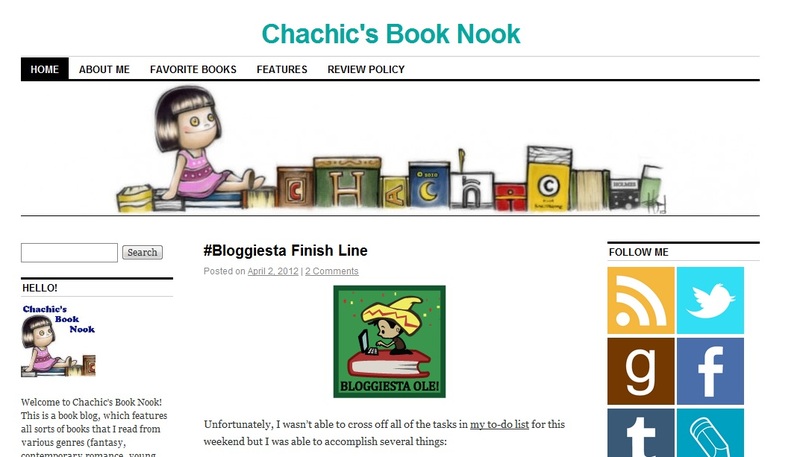 It’s Bloggiesta weekend and I wasn’t able to work on my blog because I was out the whole day. I’m trying to catch up so here’s my weekly Want Books post. I’ve been curious about this book ever since I first saw it. I don’t know why but I’m really interested in gladiators. Also, I’m a huge fan of strong female protagonists and this book definitely has that. I know the premise sounds The Hunger Games-esque but I have a feeling it’s different. Unfortunately, the book isn’t available locally so I may need to order it online if I want my own copy. I’m still doing my best NOT to buy any books as long as I can because I still haven’t bought any books in 2011. I’ve been good! I wonder how long I could hold out. During the week, Lyn lives in a big house in Cambridge, and hangs out with friends in Harvard Square. But over the weekends she cheers her father on when he gears up for neo-gladiator competition — a high-profile televised blood sport that rivals the NFL. Lyn’s father is the top player in the league, and the paparazzi that have always swarmed him have started to dog Lyn’s every move. All this fame comes with an even higher price. Lyn’s family lives with the constant presence of violence, uncertainty, and a strict cultural code set by the Gladiator Sports Association. When a skilled young fighter slays Lyn’s father, the GSA imposes an unthinkable sentence — Lyn must marry her father’s murderer. Though her mother has made a career out of marrying into Glad culture, Lyn is prepared to do whatever it takes to claim her independence. Even if it means going into the arena herself…. What about you, what book is in your wishlist? Bloggiesta has started because it’s already Friday in our part of the world. I thought I’d start the weekend with a review. 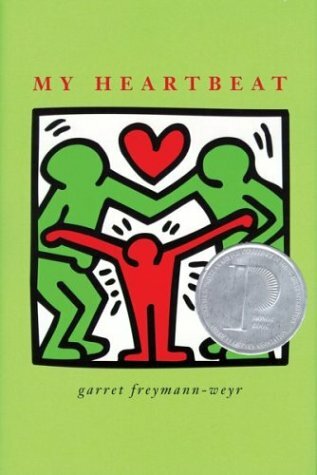 My Heartbeat by Garret Freymann-Weyr is a book that comes highly recommended by Angie of Angieville. She mentioned it as one of her contemporary YA favorites when she did a We Love YA post here on the blog. Since Angie has excellent taste when it comes to books, I decided to give this one a try. And since it’s not very well-known, I thought I should do a Retro Friday review of it. Then someone at school asks if Link and James might be in love with each other. A simple question. But the answer is far from simple, and its repercussions affect their entire lives. Would you look at that cover? I seriously have no idea what’s going on with that design. It’s like someone got excited with clip arts and decided to use that instead of looking for better options. The cover is probably one of the reasons why only a handful of people have read this book, which is a shame because it’s such a good read. It only has 160 pages so I was able to finish it in one sitting but I’m amazed at the insightful and weighty issues discussed in those few pages. My Heartbeat deals with different kinds of relationships – platonic, romantic and family relationships – and all the confusion and complications that come with those. Sexual identity is also a big topic in this one. Ellen’s two favorite people in the world are her brother Link and his best friend, James. She loves spending time with both of them and although she understands that she doesn’t know everything about them, she doesn’t really mind. Everything changes when Ellen goes to high school with them and discovers that other people view James and Link’s relationship differently. I love that line, a mind with its own heartbeat, makes me wonder what my mind is beating for. I hope that’s enough proof to convince you to read this unique novel if you haven’t read it yet because it has all sorts of goodness inside.